The performance background of most audiobook narrators includes theatre, perhaps film and television as well. Experience has trained them to reflexively adjust to these mediums’ particular performance demands (on stage they project; television and film require vocal choices be mediated by a myriad of external factors, such as location, etc.). It should follow that audiobook narrators approach narrative fiction and non-fiction dialogue according to this medium’s unique demands - that is, differently than they would in a play or a film. In my experience, what should follow sometimes doesn’t. Why? Perhaps because this medium’s demands aren’t fully recognized or appreciated. the narrative outside the quotation marks. Honoring these utterly unique elements permits the narrator the possibility of realizing his full storytelling potential. Ignore or defy them and, from my perspective, storytelling is an impossibility. For the purposes of this article, let me try and unpack these critical elements by focusing on a slice of narrative fiction (more on non-fiction in Part 2, to come). Holly leaned into Ed. She studied his wavering smile. As if Holly could see them, she assessed his inner fears, where she knew Ed lived and where Holly had to reside if Ed were to…cooperate. That is, if he were to die accordingly: his way, he’ll believe - but in truth, hers. Ed did not fail to disappoint Holly. "Kill me, then.” Holly smirked. "I swear it!” he cursed. Ed’s fingers gripped Holly’s throat. He began to shiver. Holly grimaced; her eyes bulged; she gasped, quick hiccup-like pleas for air. What she wanted, needed, begged silently for from Ed, this second, was for his fingers to squeeze harder. Literary merit way aside, an audiobook’s fundamental performance demands dictate how the narrator must approach the above narrative’s dialogue within and outside the quotes. Audiobooks come to the listener via an intimate medium: the booth. Therefore, if the listener is to maintain her willing suspension-of-disbelief, the dialogue must be spoken intimately. 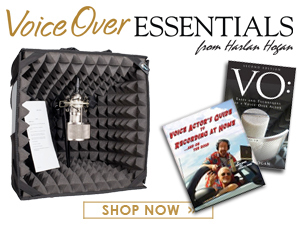 Audiobook narration is inherently intimate because the ‘booth’ - along with its microphone and other technical accoutrements – requires the storyteller to speak as if to one person and, therefore, express emotional choices intimately. In-the-booth (as opposed to on-stage or in-front-of-the-auditorium) is an intimate experience. The booth is solitary; silent: its sole purpose is to extinguish outside noise and assert a one-on-one relationship between narrator and listener. hey, I better find a way to express myself that is respectful of its demand (intimacy). I must narrate intimately – less volume, less voice. When the narrator respects the booth’s intimacy she is, ironically, liberated to turbo charge her dialogue, to act her brains out. Additionally, she maintains her intimate contract with the listener – that vital connection that, once broken, compromises the listener’s willing suspension of disbelief. A book’s dialogue - as in a play or film - may require a whisper, violent screaming fit, and every vocalized decibel in between. Technically, lots can be done to permit the actor myriad decibel choices. Still, while the dialogue may instruct one way, the medium admonishes another. That is, the character’s line may end with, "he said loudly,” but the medium mediates ‘loudly’ by insisting that too much volume interrupts - even kills - intimacy. You can speak ‘loudly,’ but it must be done so, intimately, without volume. Less volume, more stage whisper. Okay, now - so long as you stay ‘down there,’ meaning intimately loud - you can scream, yell, super-energize the line, give it all you got, blow your guts out. I often suggest to narrators: presentational acting defies the booth and disconnects the listener. For me, presentational means speaking as if to a crowd, as if the booth is a stage or a large set, as if in front of a throng, as if there’s a back row. Presentational doesn’t inherently diminish emotional import; it merely makes that emotional choice inaccessible when coming from a booth. In another venue - a stage, for example - the collective in attendance appreciate and respond to the presentational actor who kindly invites everyone to participate in that experience. But coming from the booth, presentation is overkill. What it kills, specifically, is the booth’s intimate nature. It is fair to assert, from a performer’s perspective, that the narrative is, in effect, all dialogue. The storyteller who treats the narrative outside the quotation marks, as if it exists within them, honors what is fundamental to both fiction and non-fiction: point-of view. Said differently, if it’s not a particular character speaking, it’s the story’s narrator (or literally, the author). To be sure, some portions of the narrative outside the quotes act more like dialogue than others (look carefully at our fiction example), and therefore should be regarded more like dialogue. It’s important to remember that for the author, words on a page don’t exist as if they had no purpose (just like we humans). Because the narrative, by definition, expresses ‘point-of-view’ (whether it’s a laundry list, accounting of a grizzly murder, or description of a sunset), the narrator must embody the point of view of whom or what he is speaking about – almost as if that person, place or thing is speaking. Should the entire narrative sound like dialogue? No. Dialogue inside the quotes is the character actually speaking. Outside the quotes must feel ‘as though’ the character (or place or thing being described) were speaking. Inside the quotes is the character feeling; outside embodies the character’s feeling. The easiest, if not the most rigorous, way for me to discriminate between dialogue within and outside the quotation marks is by example. Can you tolerate this slice again? What she wanted, needed, begged silently for from Ed, this second, was for his fingers to squeeze harder. When the storyteller recalls that all the narrative’s dialogue must respect the medium’s ‘intimacy’ demand and that point-of-view, the narrative’s heart and soul, appears not only inside the quotes but outside as well, only then can the author’s intent erupt, be fully realized by the narrator and inhabited by the listener. 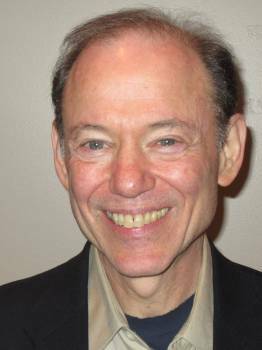 Paul Ruben has produced and directed numerous award-winning audiobooks for every major publisher since 1987. His many Audie Awards include work for It’s Not About the Bike, Raymond and Hannah, The World is Flat, A Slight Trick of the Mind. He also received the 2003 Grammy (Best Spoken Word Album) for Al Franken’s Lies and the Lying Liars Who Tell Them, and the 2009 Grammy for Always Looking Up by Michael J. Fox. He has directed regional and summer theatre productions, contributed features on audiobook narration to AudioFile magazine, and was elected to the Audio Publishers Association Board of Directors in 2005. Based in New York City and casting and directing many first time narrators - some of whom have become outstanding and award-winning working narrators - he also teaches audiobook narrator workshops through his company, Tribeca Audio. I have learned so much from you. You are a superb coach...and such an asset to the industry. Thanks for the thought stimulation. You information makes me think. Thinking is of course a good thing. Fantastic! Thank you for sharing your excellent insights here. This article is extremely timely for me, as I am about to begin narrating another audiobook next week, and hope it to be my best work yet. Great great great information and well explained. A shot in the arm I needed about now! Simply marvelous! A really clear lesson on something that is sometimes so difficult to explain to new narrators. Plus it helped me see some things in a new way that I know will help my own narration. Thank you Paul for sharing! Thanks so much for posting such a great article! I really love it. It's like an audiobook narration mini course. Please, keep posting articles like this one. Thanks to John and Paul Ruben for publishing this article. Greetings from Puerto Rico.